Ambient music plays in the background of yogi Hannah Garrett’s holistic yoga class. Taught in the middle of the day on Wednesday, Nov. 14, the class created a space for students to decompress between classes. 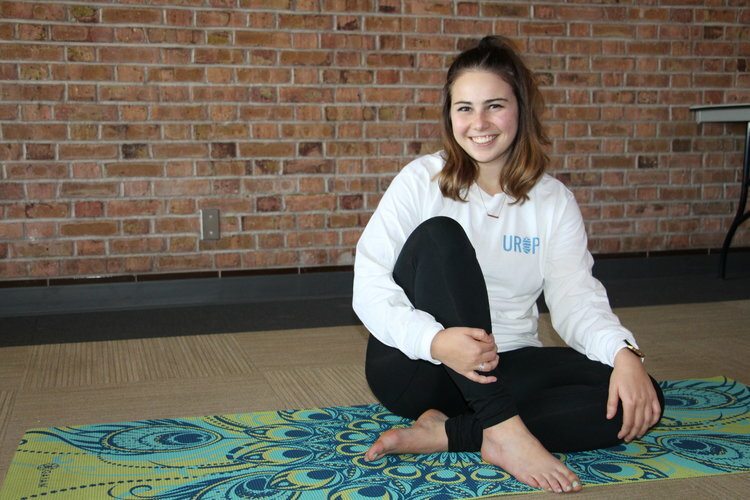 Garrett, a senior and Exercise Science major, has been practicing yoga since her first year of college in fall 2015, and now teaches yoga at UMD and various yoga studios like Runa Yoga in Duluth. The subject of her research this semester has been the effects of yoga on stress in college students. Garrett said her passion for yoga began once she started college. Now the president of Yoga Club, Garrett says that the club provides an outlet for students and faculty alike to destress. What you gain from yoga is about the intention you set going into it, according to Garrett. Second-year student and Teaching Spanish major, Greta Buehler, practices yoga following in her grandma’s footsteps. It helps her deal with stress from academics. 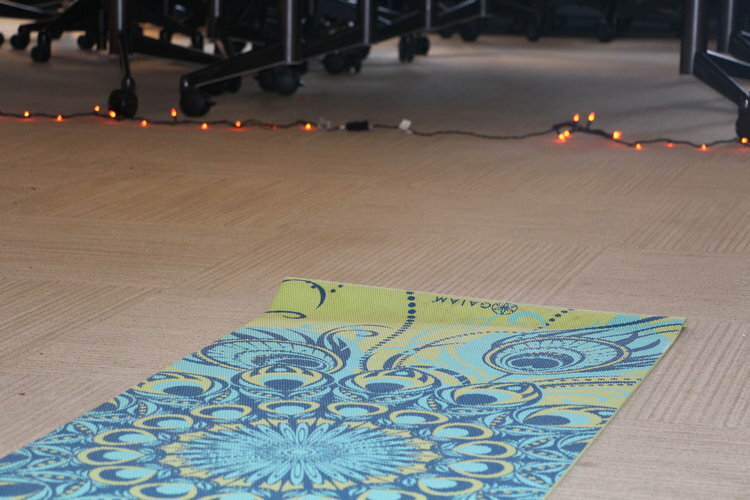 Garrett’s Holistic Yoga and Journaling event, sponsored by WRAC, was put together in hopes of bringing awareness to the different facets of health in our lives. Buehler agrees that yoga can be part of a self-care routine. Garrett discussed various ways to take care of your health in her holistic yoga class. 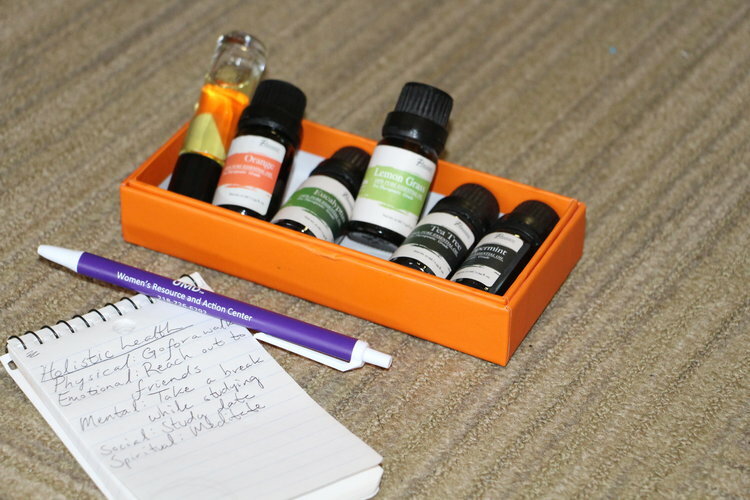 As an example, for emotional health, she suggested journaling as a way to acknowledge and let go of “unsaid feelings or thoughts.” Meditation, sleep, exercise and talking to friends are other ways of taking care of your health. Garrett had the opportunity to work with Dr. Charles Fountaine and Mrs. Kelley Phillips this semester, both of whom work in the department of Applied Human Sciences, on the first-ever UROP on yoga at UMD. This research shows that “even if you feel crunched for time, you can fit a brief yoga session into your day to potentially alleviate your stress levels,” as Garrett said. Garrett hopes to present this research in Orlando, FL, next May at the National American College of Sports Medicine Convention. With finals week rapidly approaching, students may be feeling heightened stress over exams. Taking the time to take care of yourself in between studying for exams is one way for students to stay healthy going into winter break, whether that be through yoga, going for a walk, or simply making sure to get enough sleep. Yoga Club meets on Tuesdays at 5 p.m. in SPHC 135.